Spring is in the air! For spring I love to decorate with florals. On my last trip to the thrift store, I was so excited to find this embroidery hoop and this rustic grapevine basket. Both are perfect projects for indoor upcycling until the weather gets warmer. 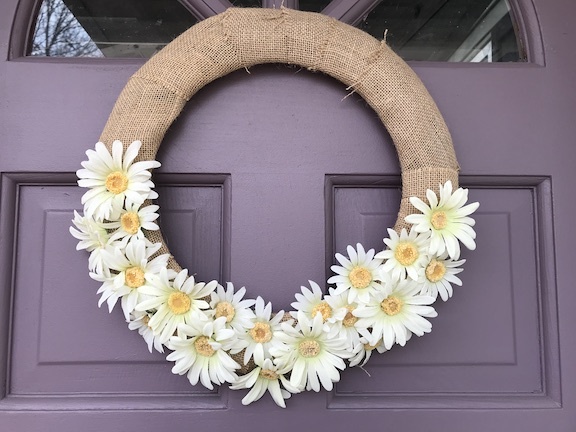 This grapevine basket was under $3 and I’m creating a spring tulip basket door hanger. 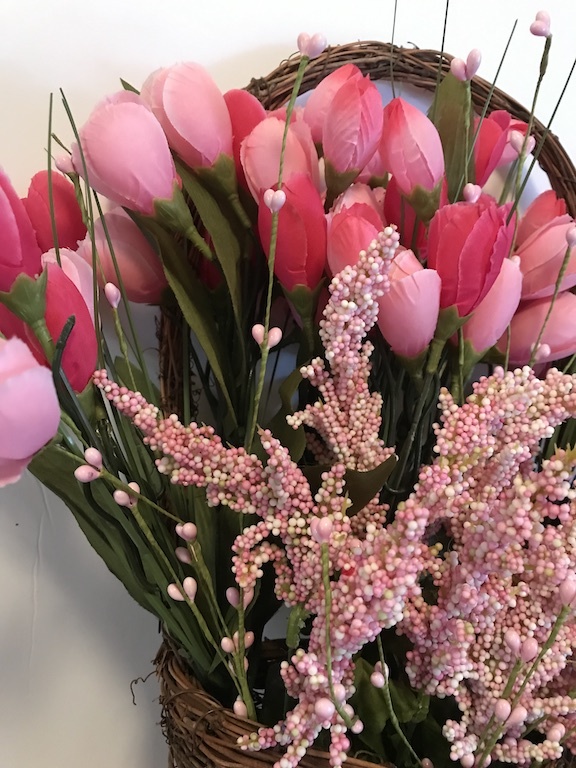 My spring decor is all about pink and natural tones this year. 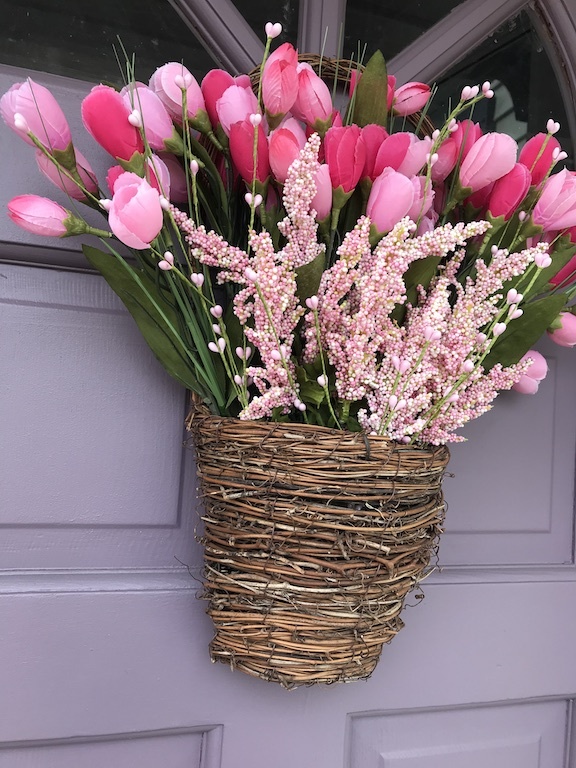 To celebrate the start of spring, I’m sharing my Spring Tulip Basket for the Welcome Spring Link Party and this months Upcycle. 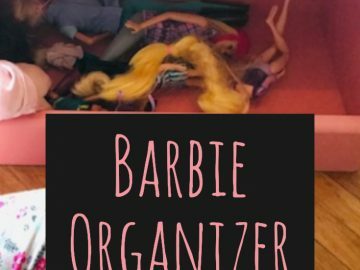 If you have a spring post, please stop by the party and share it and see all the inspiring spring projects. 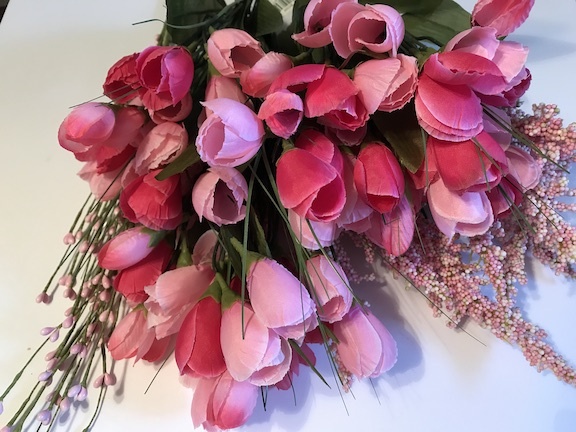 My favorite spring flower is the tulip and every fall I plant tulip bulbs, but every year the squirrels and deer eat my tulips. Those pesky squirrels just dig them right up and if they have a chance to grow the deer come by and eat them. Honestly I didn’t plant any last fall, I’m sticking with daffodils because no one seems to bother them. This year I’m going to have tulips for spring that no one can eat. 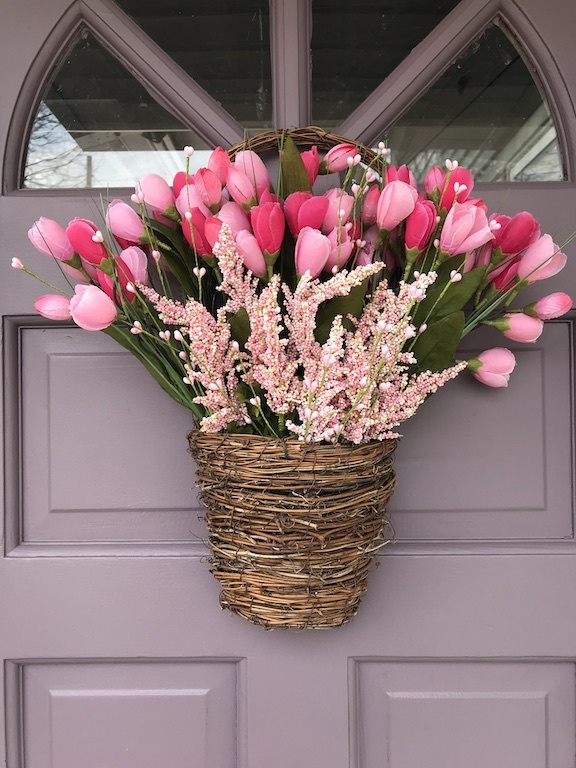 When I was thinking about creating this tulip basket, I pictured myself in a field of flowers with a basket, picking whatever my heart desired. Doesn’t that sound amazing? 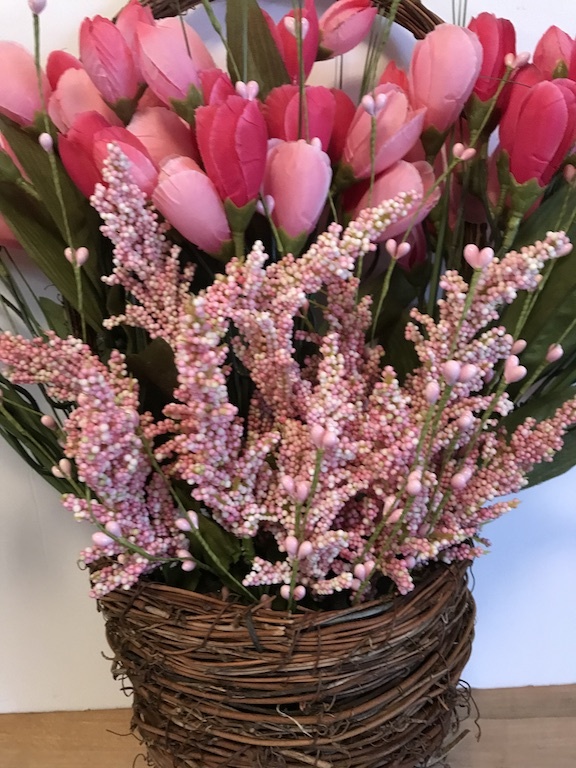 I pictured the basket in layers, for example you pick tulips first then you move onto the next flower and the flowers become layered in your basket. That’s how I saw my basket coming to life. To get started I took out the old flowers and set them aside. These daisies are in decent shape and I’m going to create a simple wreath for our shed. The daisies also get a second chance to be a pretty decoration. I just have to wait for the weather to get nicer to hang it up on the shed. The foam floral piece inside the basket was in great shape. I kept it in their because it seemed easier. 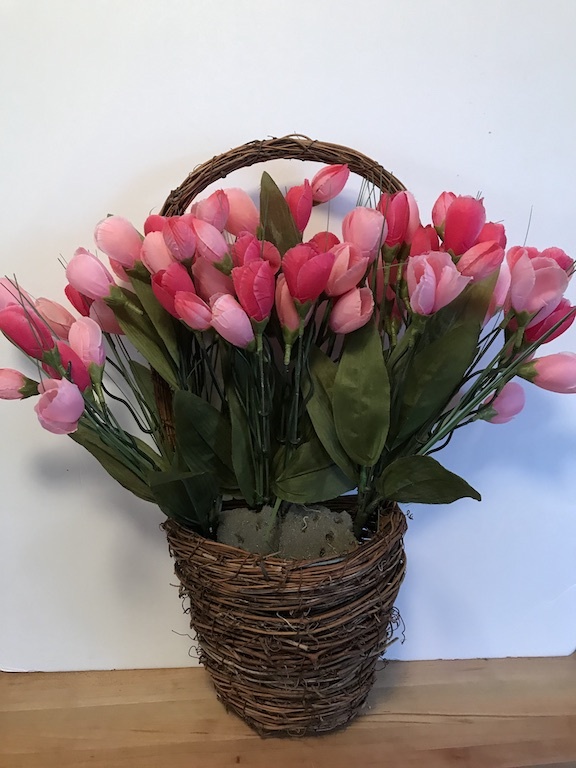 First I put the tulips in the back of the basket and they fit perfectly. Then I cut the white and pink flowers off the stem and pushed them into the foam. To finish the basket, I added in the pink beads. I add the beads to almost all my floral arrangements because I just love them. I did some shorter beads in the front and some taller pieces with the tulips. My daughter thought I made the basket for her (since it’s pink) and asked for it to hang on her door. I told her it could for a few days before I put it outside. She doesn’t know it yet, but soon she will be getting a new bedroom decoration with pink flowers. 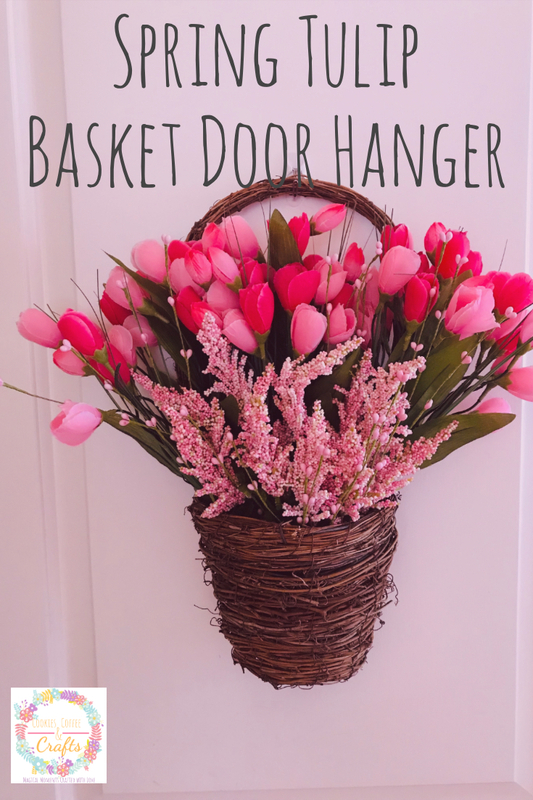 The Spring Tulip Basket Door Hanger took less then 15 minutes to make and is so pretty. 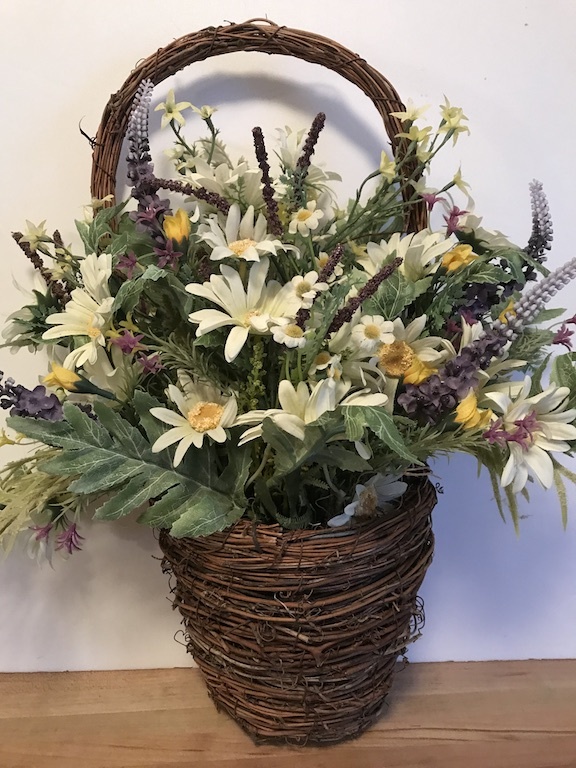 This spring basket is perfect for the whole season from Easter to Mother’s Day. 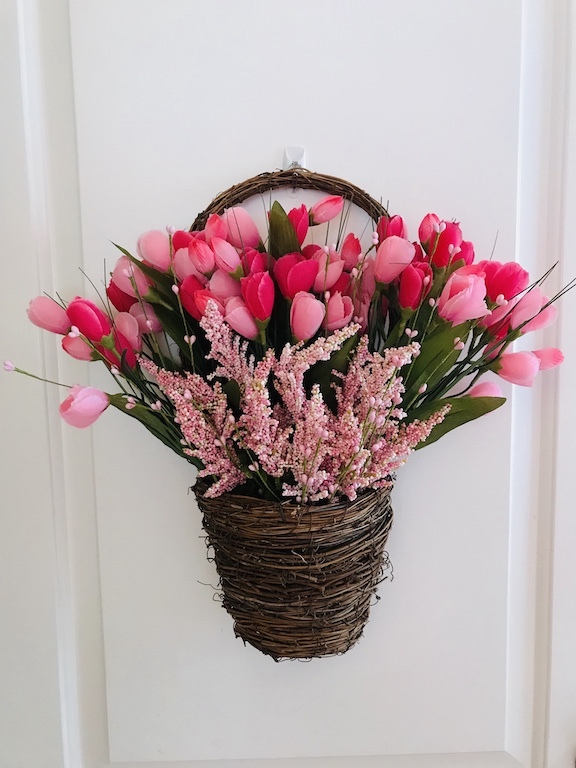 If your mom loves floral door hangers, this basket would make an excellent Mother’s Day Gift. My spring tulip basket matches my Easter Egg Wreath perfectly. I know my door decor makes me smile when I come home and I hope they make someone smile as they drive or walk by.